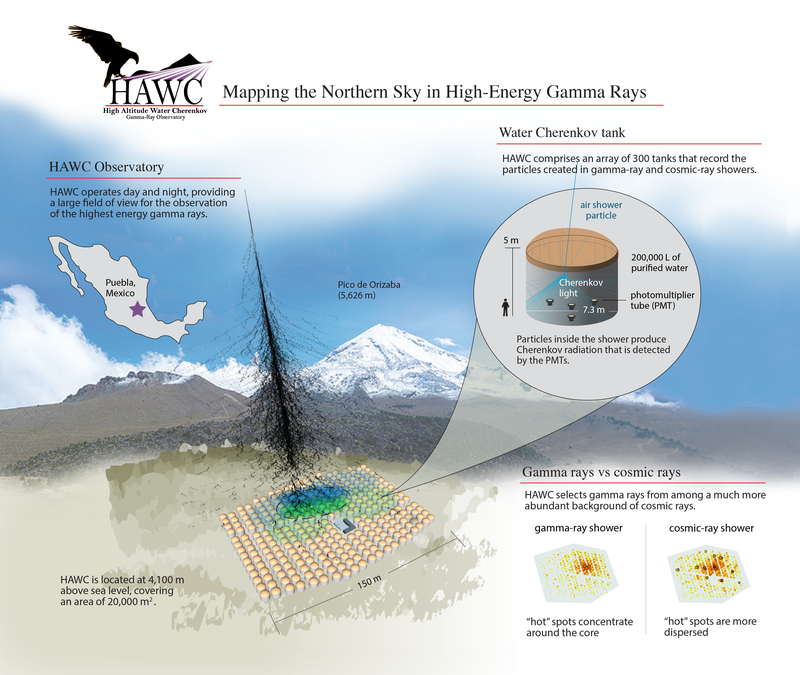 The United States and Mexico constructed the High Altitude Water Cherenkov (HAWC) Gamma-Ray Observatory to observe some of the most energetic phenomena in the known universe—the aftermath when massive stars die, glowing clouds of electrons around rapidly spinning neutron stars, and supermassive black holes devouring matter and spitting out powerful jets of particles. These violent explosions produce high-energy gamma rays and cosmic rays, which can travel large distances—making it possible to see objects and events far outside our own galaxy. Today, scientists operating HAWC released a new survey of the sky made from the highest energy gamma rays ever observed. The new sky map, which uses data collected since the observatory began running at full capacity last March, offers a deeper understanding of high-energy processes taking place in our galaxy and beyond. 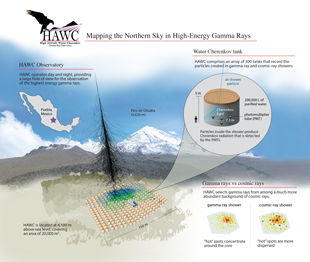 HAWC researchers presented the new observation data and sky map April 18, 2016, at the American Physical Society meeting. They also participated in a press conference at the meeting. 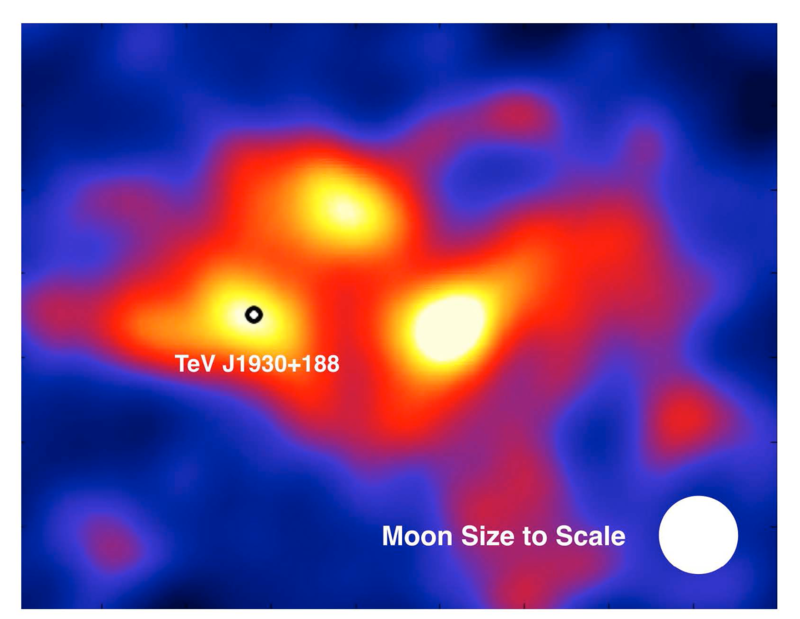 The new sky map shows many new gamma ray sources within our own Milky Way galaxy. Because HAWC observes 24 hours per day and year-round with a wide field-of-view and large area, the observatory boasts a higher energy reach for extended objects. In addition, HAWC can uniquely monitor for gamma ray flares by sources in our galaxy and other active galaxies, such as Markarian 421 and Markarian 501. One of HAWC’s new observations provides a better understanding of the high-energy nature of the Cygnus region—a northern constellation lying on the plane of the Milky Way. A multitude of neutron stars and supernova remnants call this star nursery home. HAWC scientists observed previously unknown objects in the Cygnus region and identified objects discovered earlier with sharper resolution. In a region of the Milky Way where researchers previously identified a single gamma ray source named TeV J1930+188, HAWC identified several hot spots, indicating that the region is more complicated than previously thought. “Studying these objects at the highest energies can reveal the mechanism by which they produce gamma rays and possibly help us unravel the hundred-year-old mystery of the origin of high-energy cosmic rays that bombard Earth from space,” said Goodman. HAWC—located 13,500 feet above sea level on the slopes of Mexico’s Volcán Sierra Negra—contains 300 detector tanks, each holding 50,000 gallons of ultrapure water with four light sensors anchored to the floor. When gamma rays or cosmic rays reach Earth’s atmosphere they set off a cascade of charged particles, and when these particles reach the water in HAWC’s detectors, they produce a cone-shaped flash of light known as Cherenkov radiation. The effect is much like a sonic boom produced by a supersonic jet, because the particles are traveling slightly faster than the speed of light in water when they enter the detectors. The light sensors record each flash of Cherenkov radiation inside the detector tanks. By comparing nanosecond differences in arrival times at each light sensor, scientists can reconstruct the angle of travel for each particle cascade. The intensity of the light indicates the primary particle’s energy, and the pattern of detector hits can distinguish between gamma rays and cosmic rays. With 300 detectors spread over an area equivalent to more than three football fields, HAWC “sees” these events in relatively high resolution. “Unlike traditional telescopes, with HAWC we have now an instrument that surveys two-thirds of the sky at the highest energies, day and night,” said Andrés Sandoval, Mexico spokesperson for HAWC. HAWC exhibits 15-times greater sensitivity than its predecessor—an observatory known as Milagro that operated near Los Alamos, New Mexico, and ceased taking data in 2008. In eight years of operation, Milagro found new sources of high-energy gamma rays, detected diffuse gamma rays from the Milky Way galaxy and discovered that the cosmic rays hitting earth had an unexpected non-uniformity. HAWC is a joint collaboration between the United States and Mexico that includes over 120 scientists from 25 universities and national laboratories. Goodman led a team of UMD physicists that pioneered development of the observatory and managed its construction from 2011 until 2015. In addition to Goodman, other collaborators from the UMD Department of Physics have included associate research scientist Andrew J. Smith; postdoctoral researchers Brian Baughman, James Braun, Daniel Fiorino and Colas Rivière; and graduate students Israel Martinez Castellanos, Kristi Engel and Joshua Wood. 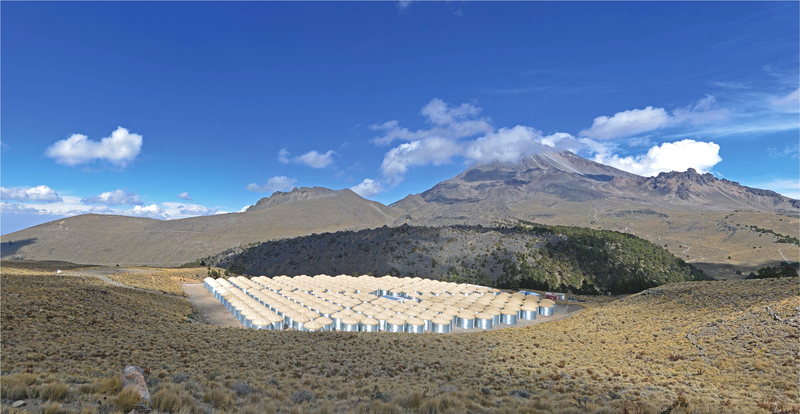 The National Science Foundation, the U.S. Department of Energy and the Los Alamos National Laboratory provided funding for the United States’ participation in the HAWC project. The Consejo Nacional de Ciencia y Tecnología (CONACyT) is the primary funder for Mexican participation. The content of this article does not necessarily reflect the views of these organizations.